Heat oven to 375°F. In 2-quart saucepan, heat beef, frozen vegetables, onion and gravy to boiling over medium heat, stirring frequently. Boil and stir 1 minute. Keep warm. In medium bowl, stir dry potatoes and hot water; let stand until water is absorbed. Stir in Bisquick mix, milk and chives until dough forms. Place dough on surface sprinkled with Bisquick mix; gently roll in Bisquick mix to coat. Shape into ball; knead 10 times. Pat into 11x7-inch rectangle. Fold dough into thirds. Pour beef mixture into ungreased 11x7-inch (2-quart) glass baking dish. Carefully unfold dough onto beef mixture. Bake uncovered 30 to 35 minutes or until crust is golden brown. 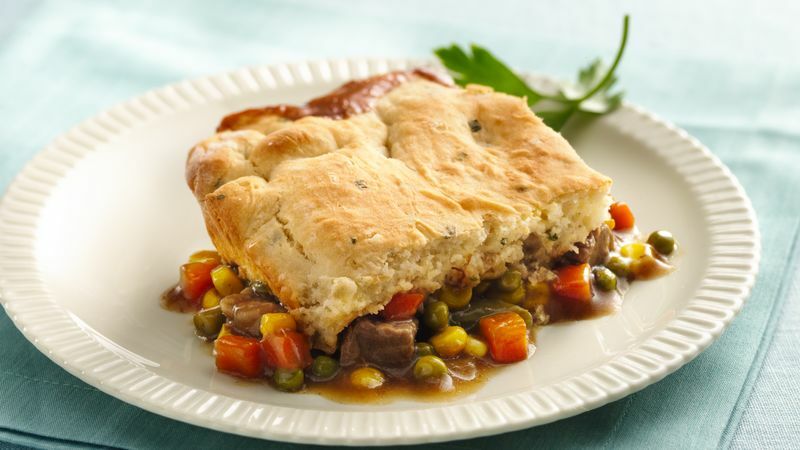 It’s important that the beef mixture is warm when the crust is placed on top. The heat from below helps cook the topping. For Chicken Pot Pie with Potato Biscuit Crust, use rotisserie chicken from the deli and chicken gravy in place of the beef and beef gravy. Add 2 tablespoons dry red wine to the beef mixture for a special Beef Burgundy Pot Pie.